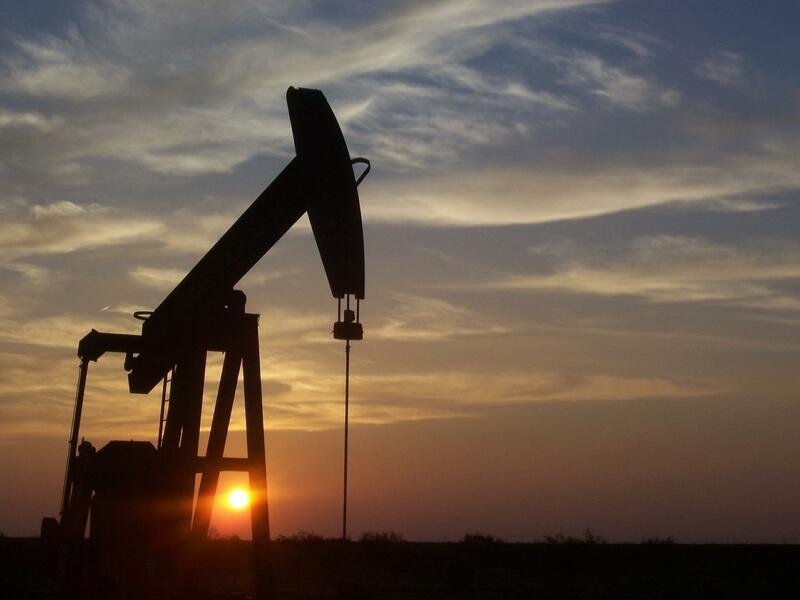 The depressed Canadian oil prices during Q4 impacted Prairie Provident. The company operates at high costs and the liabilities are important. Compared to Bonterra Energy, the stock price upside potential is similar in the context of higher oil and gas prices. But, in the scenario of modest oil and gas prices, Prairie Provident's value doesn't have any downside protection. Prairie Provident Resources (OTC:PRPRF) released the Q4 results. With the depressed Canadian oil prices impacted, the company generated negative adjusted funds flow due to its high costs. Also, the liabilities are important. Management is renegotiating the financial covenants and the decommissioning liabilities are high. In this context, the downside protection doesn't exist if oil and gas prices stay moderate. In the scenario of realized oil prices above C$70/boe, the upside potential is important. But Bonterra Energy's (OTCPK:BNEFF) potential is similar while lower costs and lower debt offer downside protection. Note: All the numbers in the article are in Canadian dollars unless otherwise noted. With the acquisition of Marquee in November 2018, the Q4 production grew 21.9% year-over-year to reach 5,937 boe/d. Liquids represented 70% of the production. In this article, I'll compare Prairie Provident with Bonterra Energy as these two small companies operate a similar production mix. Despite the strong increase in production volume, revenue dropped 40%. As shown in the table below, the depressed Canadian oil prices impacted the crude oil average realized prices. The per-unit costs increased compared to the previous quarter. The royalty costs are the exception as they depend on oil prices. The table below shows the company operates at high costs compared to Bonterra. On average, Prairie Provident's cash costs exceed Bonterra's cash cost by about C$10/boe. Also, even in the context of higher Canadian oil prices during Q3, Prairie Provident generated a tiny positive total netback of C$0.8/boe before unfavorable hedges. The company doesn't communicate any information about sustaining costs. But I consider the 2018 capital program of C$29.55 million to represent the sustaining capex as the 2018 production dropped only 1.8% compared to last year. Thus, I estimate the per-unit sustaining capex at C$29.55 million/(5,372 boe/d * 365) = C$15.07/boe. It's not a conservative assumption, though. The 2018 production includes the production from the Marquee acquisition as from November 2018. 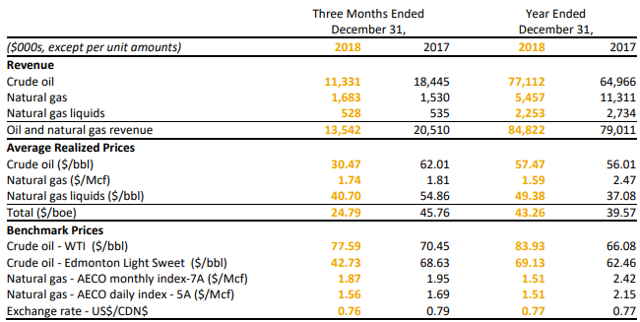 Based on the Q4 production, I estimate the company needs to realize the oil and gas prices listed in the table below to operate at a profit while holding production flat. I prefer to consider the profitability threshold with Q3 total costs of C$51.53/boe instead of Q4 results due to the lower royalty costs in Q4. Considering these high costs and the depressed Canadian oil prices during Q4, the adjusted funds flow was negative at C$5.35 million. And with the net capex at C$4.66 million, the net debt increased to C$117 million. The net debt to TTM adjusted funds flow ratio is very high at 14.6x. Also, due to the disastrous Q4, the company is about to breach its financial covenants. Management expects an agreement with the lenders for an adjustment of the covenants. But, in case of another oil downturn, the situation will become even more challenging with a high cost of debt and short-term maturities. The US$28.5 million senior notes, due by October 2021, bear interest at 15% per annum. The revolving facility and the negative working capital constitute the rest of the net debt. And besides the high debt, the decommissioning liabilities are also important at C$148.5 million. 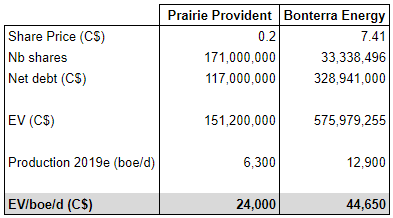 Considering the higher netbacks Bonterra Energy generates, Prairie Provident's lower flowing barrel valuation makes sense. The small difference between the EV/PDP and EV/Proved reserves ratios of both producers are surprising. Also, with a current stock price at C$0.20, the market values Prairie Provident at a 53.5% discount to the PDP NAV of C$0.43/share. But you must be prudent when comparing the stock price to the NAV. The company didn't communicate its NAV estimate last year. But, based on the 2017 reserves report, I calculated the PDP NAV in 2017 was about C$0.8/share. The NAV calculation is based on oil and gas prices assumptions I would not qualify as conservative, as shown in the chart below. Also, the NAV doesn't take into account the G&A costs. Even if management expects to lower these costs to about C$3.70/boe in 2019, they're still high. In my previous article about Bonterra, I proposed two fair value estimates based on the assumptions of total netback at C$7/boe and C$14/boe, depending on the oil and gas prices. 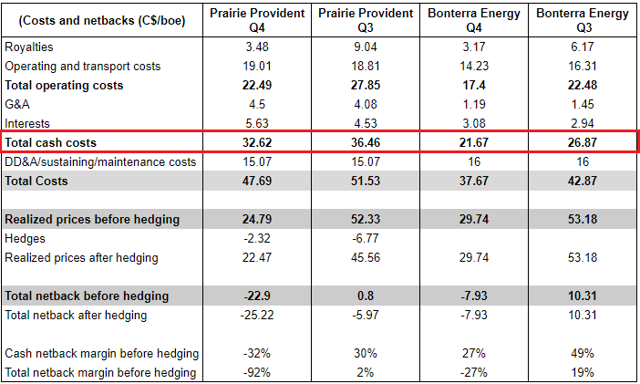 As Prairie Provident's costs are about C$10/boe higher compared to Bonterra's, the same assumptions imply a valuation based on a negative total netback of C$3/boe and a positive total netback of C$4/boe. In the first scenario of a negative total netback, Prairie Provident's equity is worth zero. It's consistent with the fact that the company needs a realized oil price above C$70/boe to operate at a profit holding production flat. 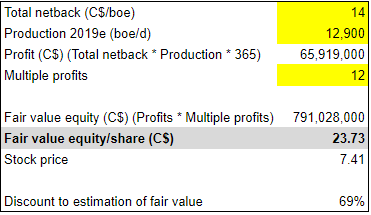 For the fair value estimate based on a total netback at C$4/boe, as always, I assume a 12x multiple to the profits while holding production flat. Based on these assumptions, the market offers a 69% discount to the fair value estimate. It's interesting to note that, with the equivalent total netback of C$14/boe (C$4/boe + C$10/boe of lower costs), the market values Bonterra with the same 69% discount to the fair value estimate. Due to the high costs and the high debt, investing in Prairie Provident is very risky. But with optimistic oil and gas price assumptions, the discounts to Prairie Provident and Bonterra fair value estimates are similar. Thus, investing in Prairie Provident and Bonterra offers a similar upside with optimistic oil and gas prices assumptions. But in case of a modest - not necessarily depressed - oil and gas prices environment, the downside protection doesn't exist with Prairie Provident. With high costs and important liabilities, the depressed Canadian oil prices impacted Prairie Provident in a meaningful way during Q4. The financial covenants are being renegotiated. And the company needs to realize oil prices above C$70/boe to operate at a profit while holding production flat. In a scenario of higher oil prices, the market values the company at a discount to the PDP NAV. The upside is similar to Bonterra's potential. But, thanks to its lower costs, Bonterra offers a downside protection Prairie Provident doesn't have. Note: If you enjoyed this article and wish to receive updates on my latest research, click "Follow" next to my name at the top of this article. Disclosure: I am/we are long BNEFF. I wrote this article myself, and it expresses my own opinions. I am not receiving compensation for it (other than from Seeking Alpha). I have no business relationship with any company whose stock is mentioned in this article.